Luxury spacious apartment overlooking Mediterranean Beach. Leisure Activities:: There are a great variety of leisure activities on offer in Mojacar: various water sports to be enjoyed on Mojacar's blue flag sandy beach, canoeing, horse-riding, microlite and ultralite flights, quad bike hire, windsurfing, banana and sausage rides, water-skiing, sea canoes, kite flying, scuba-diving and snorkelling to name but a few. In the Tabernas desert the Mini-Hollywood Cowboy Town has been the scene of countless westerns. Wild West shoot-outs, bank robberies, can-can dancing and public 'hangings' are some of the attractions. A zoo and a 'parrot spectacular' have also made their home on the Range. A fun day for the family can be enjoyed in the beautiful surroundings of the Aqua-Park situated in the district of Vera. EATING OUT:: Eating out in Mojacar and its surrounding villages and towns is an eating experience not to be missed. The area's gastronomy is varied and exquisite both for seafood enthusiasts and meat eaters alike. A wide selection of beach bars and restaurants in the area cater for almost every taste, most staying open until you decide to leave. The old village of Mojacar, a short distance away is full of character and charm. Its labarynth of cobbled walkways offer a variety of restaurants and quaint shops as well as spectacular views of the surrounding areas. There are lots of cafes/bars/restaurants within walking distance of the apartment and as the apartment is directly across from the beach you can enjoy the many beach bars which dot the promenade. On confirmation of booking, I will email our List of Restaurants/Bars we have visited! A Guest Book in the apartment also has opinions of all our guest which is a great read!! Golf/Skiing:: Golf enthusiasts and beginners alike can enjoy this sport on the various courses in the surrounding areas. Valle del Este: This 18-hole golf course has been carefully designed to combine holes that represent a real challenge to the player. It has been designed along the lines of the courses in the American desert of Arizona and California paying careful attention to every detail and integrating the course into the surrounding landscape. Desert Springs: Located between Villaricos and the Caves of Almanzora. Marina Golf: Situated between Mojacar Playa and the town of Garrucha. Cortijo Grande: 18-hole golf course situated in the town of Turre only a short distance from Mojacar. Skiing: For the beginner or more advances skier, one of the most spectacular ski resorts can be found in the Sierra Nevada near Granana, only 2 hours drive from Mojacar. It has been said that the Apres-ski here needs to be experienced to be believed. The main bathroom is very large with both a bath and overhead shower. From the shower you can see directly out onto the spectacular view of the sea. The en-suite has a toilet, whb and full shower. THE BALCONY ENJOYS SUN ALL DAY DURING SUMMER MONTHS!! We have Mosquito Screens on all the bedroom windows, bathrooms and lounge windows but it is also advisable to bring your own mossie protection just in case. Also new mattress on beds. Canopys installed on part of the Balcony (see Pics) - instructions will be sent to guests! Canopy has 3 sides which can be used one at a time or all together while still affording guests the beautiful views of the Beach and Mojacar Playa through the very large windows on all sides! WE NOW HAVE SPANISH STAELLITE TV AS WELL AS ENGLISH PROGRAMMES. TENEMOS SATELITE ESPAÑOL televisión para todos los clientes ESPAÑOL PARA DISFRUTAR. with Liam and jeans, the hosiptalité is key. 5min walk from the most beautiful beach and the best location mojacar restaurant is ideal. The best apartment we have stayed in! We stayed at Liam and Jean's apartment for 10 days in July and August 2016 (2 adults and 2 children). The apartment itself was large, clean and airy and the apartment complex was very friendly and well looked after. The air con and hot water is metered but despite being here in August we only ever needed to put 1-2 euros in per day between 4 of us. The balcony of the apartment has large patio doors and shades/awnings which keep the place very cool when there is a breeze. The apartment is up a steep hill but the benefit of this is the absolutely fantastic view from the balcony. If you are sat outside in the evening or early morning it almost feels like you are sat on the beach. Usually we eat out most nights when we are away but this year it seemed such a shame to waste the view that we ate in a few times. When we did eat out the apartment is really well placed for restaurants and bars, for the bus to Mojacar Pueblo. It is also an easy bus ride to the waterpark at Vera. The apartment has WIFI which we can confirm is very reliable. Jean and Liam made the whole process of booking and planning our trip very easy - thank you. We would love to visit again. Hi Carolyn, thank you so much for your lovely review. We're so glad you enjoyed your stay in Mojacar and our apartment, despite the hill 😄.... It's difficult sometimes to convey how beautiful Mojacar is. You really have to experience it. Thanks again for your lovely words. Best wishes, Jean and Liam. Hi Suzanne, thanks so much for your lovely review. We really do appreciate it. So glad you had a good holiday and that you enjoyed Mojacar and our apartment. We try to convey how beautiful the view is from the apartment but it's something you have to see really to appreciate how lovely it is. Thanks again Suzanne. Have a great summer. Best regards, Jean and Liam. Had a very enjoyable stay for approximately three and a half weeks.Apartment was clean and well furnished.The terrace has a wonderful view and the weather even in November allows you to be outside as much as you want. The owners, Liam and Jean, were extremely friendly and everything was well organised. Mojacar at this time of year is very quiet which suited us but if you agree looking for something a bit livelier it's best to avoid this time of year.However would strongly recommend La Pika and Joe Beach as places to dine.Titos was also good and all three are near the apartment. In summary the apartment, location, facilities and customer service were first class and I will be returning. Would recommend to my family and friends without hesitation. Hi David, thank you so much for your lovely review. We really are very grateful. 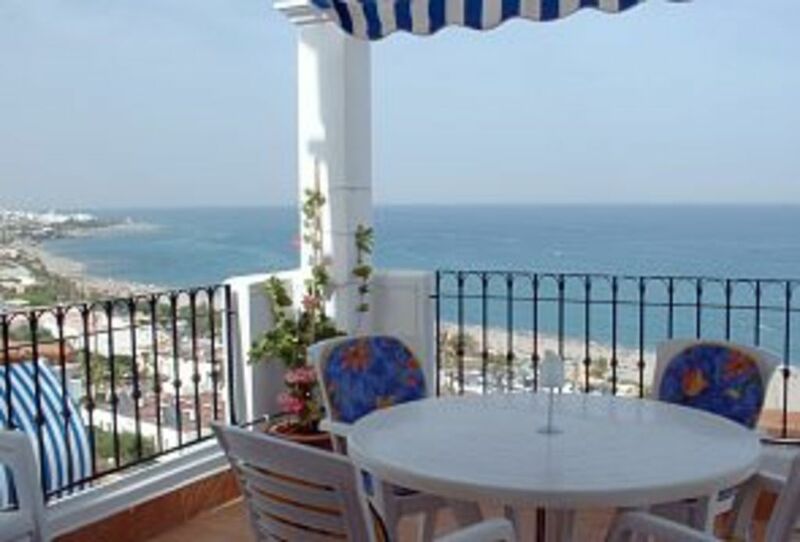 It's hard to tell people how beautiful Mojacar is and especially how beautiful the view is from our balcony. So thrilled ye had a good experience and delighted ye liked the apartment. Thanks again David for your review and we hope to talk to you again in the future. Have a good summer. Best regards, Jean and Liam. We had a great time in Jean and Liam's apartment. The view is stunning and the location perfect. It's a lovely, comfortable and relaxing place to stay and our 1 year old really enjoyed the huge terrace (as did we). The retractable blinds and canopies are a great touch. Mojacar Playa is a very manageable and easy to get around place with all amenities, and a great base for exploring the coast and inland in this really attractive and interesting part of Spain. Jean was wonderfully friendly and helpful throughout, providing lots of very useful information. A really relaxing break in a great spot. Thank you Adrian for your lovely comments! Truly appreciated. It was a pleasure dealing with you and your lovely family. I'm so thrilled you enjoyed your holiday in Mojacar. This was our second visit to this great property. It was even better than the first and that was brilliant! The view every morning is breathtaking. It is difficult to find fault if you are looking for a relaxing holiday away from, yet close enough to, great bars and eateries if you want. Cardiac hill doesn't get any easier!! Other Activities: Go Karting, sea canoes, snorkelling, microlite and ultralite flights.